WELCOME TO THE JULY 2017 EDITION OF THE GO LOCAL. GO TEXAN. E-ZINE. Welcome, race fans! We are proud to feature Austin Wayne Self and his No. 22 Toyota Tundra, which proudly displays the iconic GO TEXAN mark right on the hood. Self also dons GO TEXAN on his race gear. It’s a great experience to watch a skilled driver negotiate the track and other drivers at such high speed, but most importantly, I’m so happy we are able to work with a Texas-based company that partners with other Lone Star State companies to promote Texas products to NASCAR fans around the world. The partnership between the Texas Department of Agriculture’s (TDA) GO TEXAN program and AM Racing for the Camping World Truck Series was announced last year. 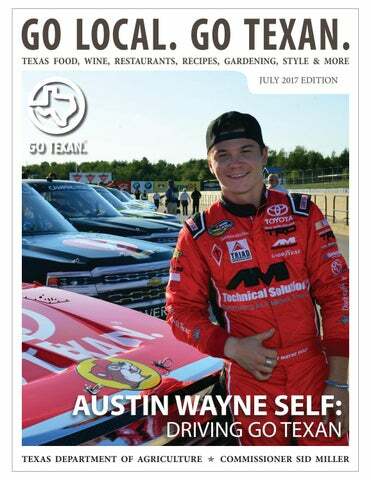 As a GO TEXAN member, AM Racing and Self promote the GO TEXAN program and the best of Texas. Carnivore, Big Red and Four Escobars Barbecue Sauces. This list will undoubtedly keep on growing. AM Racing is a Texas-based company, owned by Texans and featuring a native-Texan as its driver. 2017 marks Self’s sophomore year in the NASCAR Camping World Truck Series. Self’s vehicle is a Toyota Tundra with the 2016 body style that mimics the ones made in San Antonio. As always, we’re happy to show off the wide diversity among our GO TEXAN members. In this issue, you’ll also find articles on spices, pet products and a fine GO TEXAN restaurant called La Gloria. We hope you’ll enjoy this issue. Be sure to share it with your friends, and remember, Texas Agriculture Matters! AUSTIN WAYNE SELF: DRIVING GO TEXAN AUSTIN WAYNE SELF GOES WHERE FEW TEXANS DARE: BEHIND THE WHEEL OF AN AERODYNAMICALLY-DESIGNED RACE TRUCK AT SPEEDS OF MORE THAN 180 MILES PER HOUR. SELF IS A GREGARIOUS 21-YEAR-OLD WHO IS COMPETING AS A NATIONALLY-RANKED DRIVER IN THE NASCAR CAMPING WORLD TRUCK SERIES (NCWTS) DIVISION. “It’s like an addiction,” Self said. “You get up to a speed like that and you can’t get enough of it.” His biggest thrill is starting somewhere in the middle of the pack and making passes as he speeds his way to the front. Self was introduced to racing at age 5 by his father, who wanted to race himself. However, when he shared this interest with his wife, she demanded that it be a father/son activity. Dad bought young Austin a go-cart, and they started racing together in New Braunfels. “I probably raced go-carts until I was 8 years old,” Self said. Automobile Racing Club of America (ARCA) for two years, which he likens to playing ball at the NCAA level before entering the NFL. He entered the NASCAR Truck Series division in 2016. In NASCAR, Self drives a fairly topheavy vehicle that wasn’t exactly designed for racing, so his crew modifies the body of the truck to use the aero-dynamic forces to press the vehicle down to the ground so it can hug the corners and power out with gusto. The tricky part is how these aerodynamic-dependent vehicles start to behave when they’re all bunched up close to each other. Last year, Self’s team, AM Racing, become a GO TEXAN member to proudly display his love for the Lone Star State. Johnny Hernandez, La Gloria’s owner, said that the idea for having his own business came at a very young age. In fact, Hernandez grew up in a family business and felt very comfortable with the idea of creating his own legacy. Hernandez said. “Our nonGMO corn is grown by the Kolapel family of La Coste, Texas, which is just 20 miles away from my kitchen. Now, that’s as local as it gets.” Exciting things are happening at La Gloria. Hernandez said that his hope is that you will feel like you are in Heaven when eating La Gloria’s delicious food. “As the saying goes, you don’t have to die to go to Heaven,” Hernandez joked. Check out La Gloria this summer and sit out on their patio with some chips and salsa. Be sure to try Hernandez’s favorite dish — snapper chile lemon with ceviche verde. Find their menu here. efore she began Wondercide Natural Products, an innovative and holistic approach for natural pet care company, Stephanie Boone was a real estate tax consultant and litigation manager. When she started the company, Boone said she didn’t know very much about the pet industry or the chemistry behind creating pet products. That all changed when she knew she needed to find a way to protect animals from pests without using chemical pesticides. a supportive community that they can learn from and contribute to. Being a proud Austin local and a GO TEXAN member makes it even easier to do that. Boone began experimenting with different ingredients for her pest repellant after her dog, Luna, had a troublesome reaction to vetprescribed flea and tick treatments. Boone explained that there are many benefits to what her company is doing, but the biggest payoff is knowing that she is helping pets, people and the planet. RECIPE: FRESH SPRING ROLLS WITH TEXAS GULF SHRIMP We suggest setting everything up and have a spring rolling party! Serves 4 to 6. SPOT THE GO TEXAN MARK CHALLENGE Want a fun way to share the best of Texas with the world? Itâ&#x20AC;&#x2122;s easy! 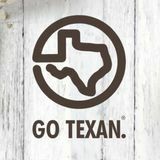 GO TEXAN uses social media tools like Facebook, Instagram and Twitter to post GO TEXAN events, share member news and increase awareness of the wide variety of products grown and made right here in the Lone Star State. Challenge: If you spot the GO TEXAN mark, let us know. Send us a picture of the mark on a product, sign or printed materials, and tell us where you saw it. Be sure to use the GO TEXAN hashtag (#GOTEXAN) when you post, so we can easily share your message, or send us an email. UPCOMING TEXAS EVENTS July 15: Mango Festival, Bayview July 15: Night in Old Fredericksburg at Gillespie County Fair, Fredericksburg July 22: National Day of the Cowboy, Amarillo July 23-29: Texas State 4-H Horse Show State Finals, Abilene July 27-30: Viva Big Bend, Alpine August 10-12: Nursery/Landscape EXPO, Dallas August 12: El Camino Real de SUP, Bastrop August 12: Main Street Art Stroll, Gladewater August 18: Grape Stomp at Pedernales Cellars, Stonewall August 26: Grape Stomp at Becker Vineyards, Fredericksburg September 2: Doss VFD Benefit Fish Fry, Doss September 2-3: Arts Alive, Corpus Christi September 8-9: Fiesta Del Centro, Alice September 29-October 22: State Fair of Texas, Dallas View more Texas events here. Launched in 1999 by the Texas Department of Agriculture, GO TEXAN, with its signature mark in the shape of Texas, celebrates, promotes and supports the business savvy and plainspoken grit Texas agriculture is known for throughout the world. Whether it’s grown, sewn or served up on a plate, nearly 27 million Texans shop, travel and dine out in support of Texas businesses, agriculture and communities, looking for the GO TEXAN mark to light the way. To learn more about the GO TEXAN program, call (877) 99-GOTEX or visit the GO TEXAN website. Tell others about GO TEXAN! One great and easy way is to forward them this publication. All your friends have to do to is click here to subscribe, and they’ll start receiving this free monthly e-zine. The latest on Texas food, wine, restaurants, recipes, gardening, style and more.